The Oracle SOUNDEX function is one of the most interesting functions I’ve used in Oracle. Learn what it is and how it works in this article. The Oracle SOUNDEX function allows you to check what a value sounds like. It returns a value that represents the phonetic value of a string. Well, you know that the letter “a” in “apple” sounds different to the letter “a” in “army”? The SOUNDEX function can work that out. It finds out the phonetic value of the string you give it. Phonetic means that it looks the way that it sounds. Like the phonetic alphabet that you might have seen in TV shows or movies. string (mandatory): This is the value that will be converted to a phonetic value and then returned. How Does The SOUNDEX Algorithm Work? The function looks at the first letter of the string. Then, it removes all other occurrences of the letters a, e, h, i, o, u, w, y. If the function finds there are two or more letters with the same number in the original string, or adjacent except for any intervening h or ow, then remove all but the first. Finally, return the first four bytes, padded with 0. Basically, it uses the first 4 or 5 characters of the string to determine how a word sounds, and returns an alphanumeric value to represent it. See the Examples section for more information on what the output looks like. How Can I Find Values That Sound Like Another Value? A common use of the SOUNDEX function is to find values that sound like another value. For example, in your database, you have a surname of “Smith”. However, you also have a surname of “Smythe”. How do you find all records where the surname sounds like Smith, which would include Smith, Smythe, and any other variations? This is where you would use the SOUNDEX function. The important thing to remember (I’ve forgotten this many times and wondered why my result set was empty) is that you must use SOUNDEX on both sides of the WHERE clause to match the values. The SOUNDEX function returns an alphanumeric value that represents how a letter sounds (e.g. A123). If you match this to a string value, then no result will be found. You’re basically saying WHERE last_name = S123, which doesn’t match. So, remember to put the SOUNDEX on both sides of the WHERE clause. Here are some examples of the SOUNDEX function. I find that examples are the best way for me to learn about code, even with the explanation above. This example is a basic usage of the SOUNDEX function. This example uses the lower case version of “complete”, which has the same return value as above. This example uses SOUNDEX on two similar sounding words – coughing and coffin. There aren’t really any similar functions to the SOUNDEX function. The SUBSTR function can be used to check if the first few characters between two strings match, but it only works on an exact match and not what each word sounds like. 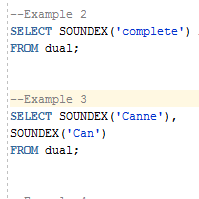 There is an alternative algorithm to SOUNDEX, called metaphone, but this needs to be implemented using a PL/SQL function. I’ll write that up in a separate article.